I used to grow these years ago--loved the fragrance, the color, the whole aura they created in the garden. Now I am happy when the day lilies make it...stubborn, hardy, can't-be-killed. Love the way the light comes through the petals in that first shot!!! What a beautiful lily! Things are actually starting to poke up through the ground in some places here where all the snow has melted, so maybe, just maybe, we will start seeing Tulips and daffodils in a month! Wonderful pictures! I just love the water droplets in the first one. anxiously waiting for the flowers in my gardens to pop up! Always enjoy your photos and post. Roses are my passion..Every early spring..I plant a new Rose..Maybe I just watch them be planted but I always touch the soil around them to place the spirit of love. LOVE the detail in that first one! Beautiful! Lovely light in these beautiful lily images! Have a wonderful week ahead Laura! beautiful, i can almost smell those intoxicating scents-its so potent and amazing! 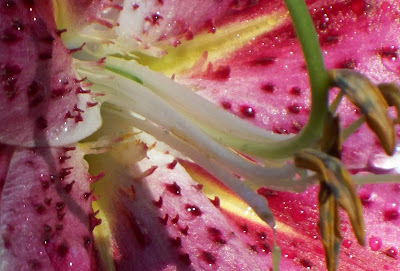 Gorgeous shots of the lily, Laura, both the macro and the full view. The light is precious. Mine are poking up out of the ground here in Ohio, but I've not grown one as lovely as that one. Keep the memories alive...it's a healthy thing to do. Fabulous colors! I never noticed the 'dots' were 3D, nice detail. Very nice lily shots. 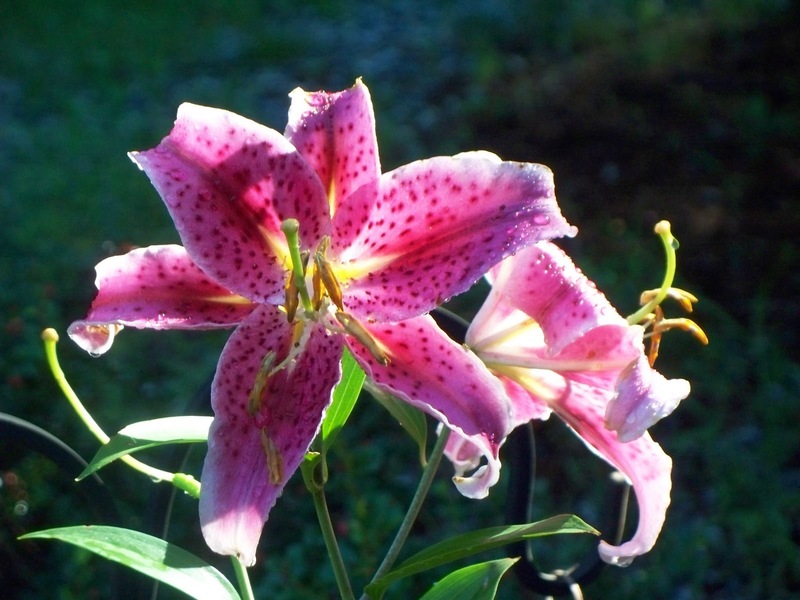 You have to watch the pollen on some, it stains ones face and nose when you smell too close.It is a favorite family of flowers, I even named my dog Lily. Amazing what is waiting under the snow. Big sunny day to you. !!! the photo is rich, magnificent, divine. your garden of beauty is within you. you are the flower, laura. A very excellent memory indeed! So many memories that make us smile. Beautiful shots of my favorite kind of lily. Happy Macro Monday Laura. I agree with EG Wow in hoping someone helps you, and with Texwisgirl that it is inside you. Also, it seems to me that you are cultivating friends all over the world and making a difference with your blog. so many kind comments today, as always! So far, no gardener...but lots and lots of love and assistance in other ways. The flowers are gorgeous. Great colors and patterns on the petals. Your photos captured my heart. Sometimes we enjoy the beauty of some places,flowers,moments just looking at the pictures left. The lilies are gorgeous. A remembered garden is a loved one. Beautiful flower and great detail! Four years ago so was mine, now it is a wilderness and the only lilies i have are in some big pots. I love all the little tentacles on the petals. me too, though it was more than four years ago now. i remember what else i am growing. i so appreciate your wonderful words and gifts.